Who like a navy blue banker stripe 3 piece suits. Everyone out in cyber-land should be raising their hands because Vinci has the pinstripe suit for you. This regal looking navy blue 3 Piece Suit features the classic business fit with a 3 button jacket with side vents and notched lapels with double pleated pants that are lined to the knee making this one well made and good looking navy color pinstripe suit. Fabric is wool touch Poly/Rayon. Jacket has side vents and pleated pants. Read More About 3 Piece Suits Here. As we all know respect is something that doesn't grow on trees but watch the way complete strangers treat you when they see you in one of these 3 piece pinstripe suits. 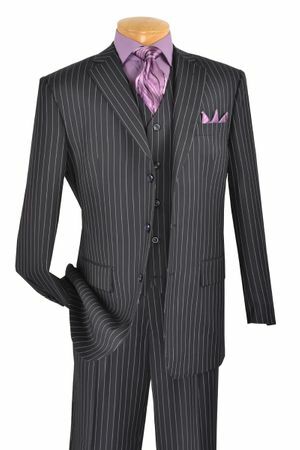 See More Pinstripe Suits Here.